Bethel House of God Church (founded in 1992). 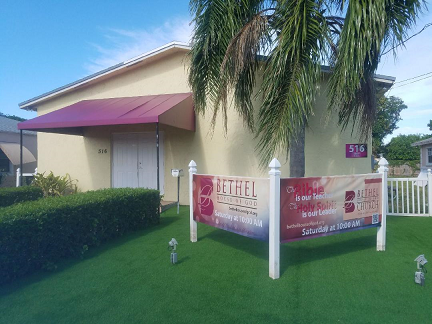 Bethel House of God Church is a multiethnic, family-oriented congregation whose purpose is to provide our community and congregants with good, skillful preaching and teaching about our Heavenly Father, His Son, and the Holy Spirit. Our praise worship services combine contemporary and traditional music with relevant, practical Bible teaching. In addition to the latest songs, we have an excellent Caribbean mixture that is appealing and inviting, and hard to sit still without joining. If you're looking for a church where you can experience friendship, grow, serve and worship, then Bethel is the place for you. Everyone is welcome. Bethel House of God Church is an atmosphere that is less commercialize, yet it offers the same quality of service as a mega church. We have very skilled musicians and singers whom are very passionate about their calling. And of course the Word of God is skillfully preached and taught with excitement. As a mid-size church; Bethel offers a comfortable, friendly, and spiritual atmosphere that makes everyone welcome. Bethel is a place where you want be just a number but a person that can become a part of ministry that is personal and caring. We pride ourselves on being financially able to break bread together after each sabbath service. Eating together is where people can truly get to know one another at the end of the service. We are always excited to have you visit and to be a part of our praise and worship experience. See you soon!!! Copyright © Bethel House of God. All rights reserved.